Purchase 1000 x 998 pixel digital file by using the Buy Now buttons below. You will receive an email with the download link. You can use the link 5 times to download the digital file. Young Innocence II. Anand Panchal's 30 x 30 inch canvas composition, 'Young Innocence II' is both touching and refreshing, highlighting a trust and bond between young friends.The beautiful colours are resplendent, like gems..
New artwork uploaded. Young Innocence II. 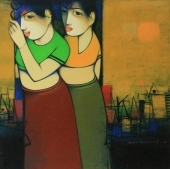 Anand Panchal's 30 x 30 inch canvas composition, 'Young Innocence II' is both touching and refreshing, highlighting a trust and bond between young friends.The beautiful colours are resplendent, like gems.